Today the Church in Wales and England celebrates the feast of St. David, bishop and patron of Wales. Very little is known about the life of St. David (Dewi Sant). He belonged to that great monastic movement which became influential in Wales in the sixth century and which had links with monasticism in Gaul and in Ireland. The earliest references to David are in the Irish Annals. Many churches across South Wales claim David as their founder. His chief foundation was at Mynyw or Menevia in Dyfed. He was canonized by Pope Callistus II in 1123. 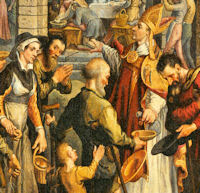 Historically today is the feast of St. Albinus, bishop and miracle worker, also known as Aubin. All the information we have about David is based on the unreliable eleventh-century biography written by Rhygyfarch, the son of Bishop Sulien of St. David's. According to it David was the son of King Sant of South Wales and St. Non, became a priest, studied under St. Paulinus on an unidentified island for several years, and then engaged in missionary activities, founding some dozen monasteries, the last of which, at Mynyw (Menevia) in southwestern Wales, was noted for the extreme asceticism of its rule, which was based on that of the Egyptian monks. David attended a synod at Brefi, Cardiganshire, in about 550 where his eloquence is said to have caused him to be elected primate of the Cambrian Church with the understanding that the episcopal see would be moved from Caerleon to Mynyw, now St. David's. He was supposedly consecrated archbishop by the patriarch of Jerusalem while on pilgrimage to the Holy Land, and a council he convened, called the Synod of Victory because it marked the final demise of Pelagianism, ratified the edicts of Brefi, and drew up regulations for the British Church. 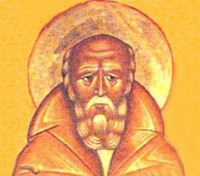 He died at his monastery at Mynyw, and his cult was reputedly approved by Pope Callistus II about 1120. Even his birth and death dates are uncertain, ranging from c. 454 to 520 for the former and from 560 to 601 for the latter. Albinus was born into an ancient and noble family in Brittany. He was a pious child and when he was still young he entered the monastery of Tintillant against the wishes of his parents. Albinus embraced the austerities of monastic life and accepted doing the most humble chores without complaining. His burning desire was to live for Christ. Respected by the other monks for setting a good example and his devotion to prayer. Albinus was elected abbot when he was just 35. The monastery flourished under his modest Rule, and the monks at Tintillant were enriched by his wisdom. In 529, after serving 25 years as abbot, Albinus was named Bishop of Angers. Although his opinions were now sought by royalty, his manner remained unpretentious. As bishop, Albinus worked for the greater good of his people, instructing them in their faith. With the support of King Childebert, he convened two councils at Orleans that condemned the incestuous marriages of many powerful families. When his diocese was raided by pagan invaders and countless citizens were taken into slavery, Albinus made every effort to ransom them while giving generously to the sick and the poor. Many miracles were attributed to Albinus. According to one story, when he was unable to procure the release of some badly treated prisoners, he prayed in front of the prison until a landslide destroyed it, allowing the men to escape. They then reformed and became model Christians and citizens. After the death of Albinus, the abbey of St. Albinus was built over his grave at Angers and became a popular place of pilgrimage. Excerpted from "Ordinary People Extraordinary Lives"